The only thing I knew about the Boy Scout Trail before today was that the one-way distance was roughly 8 miles. And while it was on my list of undone things that I wanted to do in the park, in all honesty it was towards the bottom. 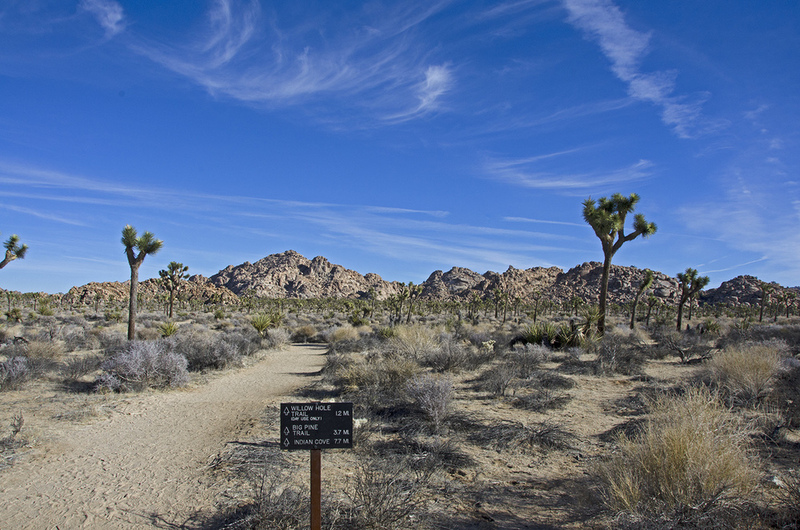 But my brother somehow talked me into meeting him at the trail end near Indian Cove campground, leaving one car there and taking the other car to the trailhead inside the park (he didn't have to try too hard, I really don't need much of an excuse to head out to J Tree for a hike) . That way we could hike the trail the easier (yes, I admit it) direction, downhill. And when we finished, drive back to pick up the other car. We met at 9:00 and got to the trailhead inside the park around 9:30. It was a beautiful day, as you will see in the stunning photos to follow. The weather was perfect, the temperature in the mid-60s and even though the parking lot at the trailhead was nearly full, we saw only a handful of hikers the entire day. 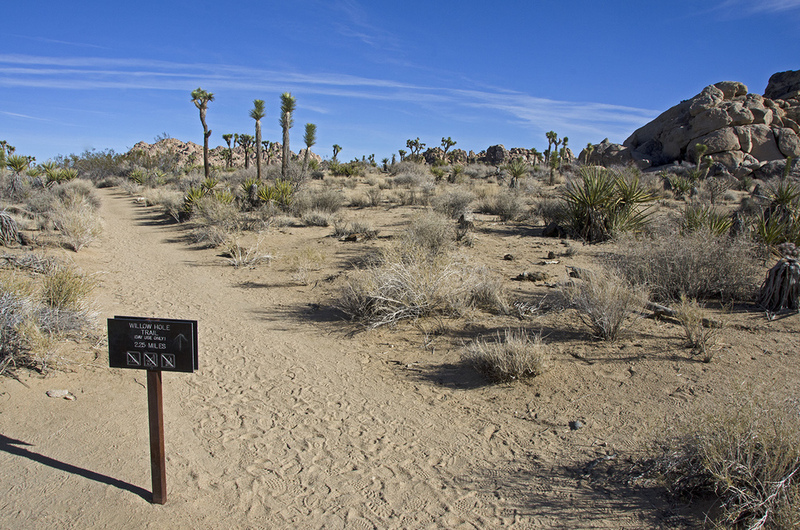 The first 2-1/2 miles or so, the trail heads across mostly flat, open high-desert filled with creosote, yucca, Joshua trees and a variety of cacti and cholla. This beginning section of the trail is slightly uphill, but barely noticeable. It's a very pleasant walk and we made good time along this stretch. My brother (I'll refer to him as "Wolfie) was going to be bringing his scout troop out in a few weeks to hike this trail, which is why we were doing the advance recon. It's always nice to know what to expect of a trail before bringing along a bunch of boys that you're responsible for. And it was a good thing we did, because after finishing the hike, he did adjust his plans a bit. 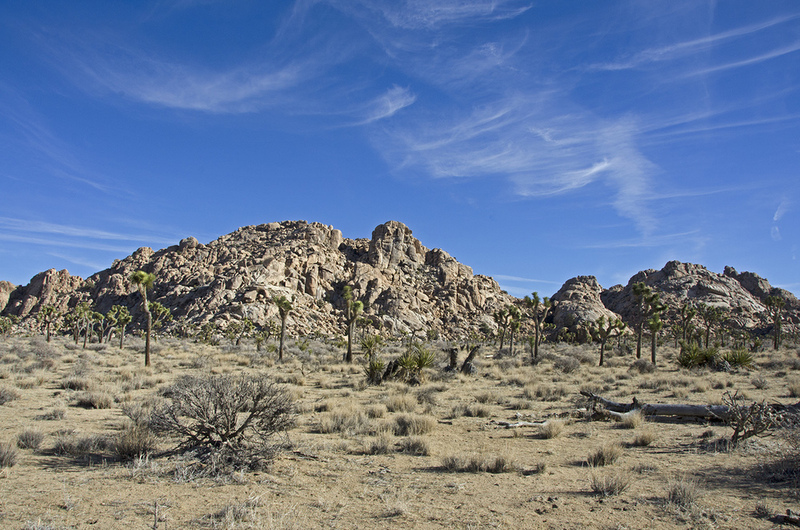 Now if you've been to Joshua Tree before, you know about THE ROCKS. After about 3 miles in, we started getting into the rocky portion of the trail. All kinds of rocks. Big. Small. Different. On the trail and around the trail. Interesting shapes never cease to amaze. And then the trail started on a very slight descent, with some ups and downs along the way. This is the best section, in my opinion, to backpack. 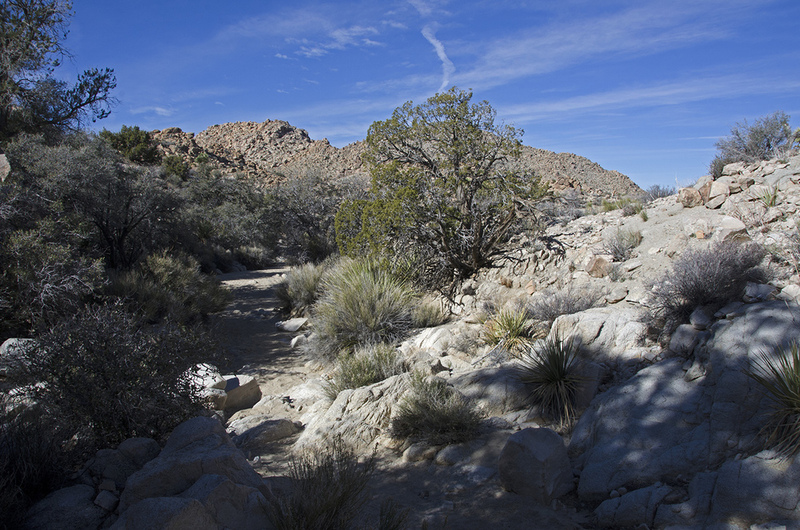 Up to about the three mile mark, the trail is easy and there are lots of great camping sites away from the trail. A little farther in and the trail gets a bit more difficult and steep, which could make the footing difficult when you have a 40 lb pack on your back. At about 4 miles, the descent became a bit more noticeable. 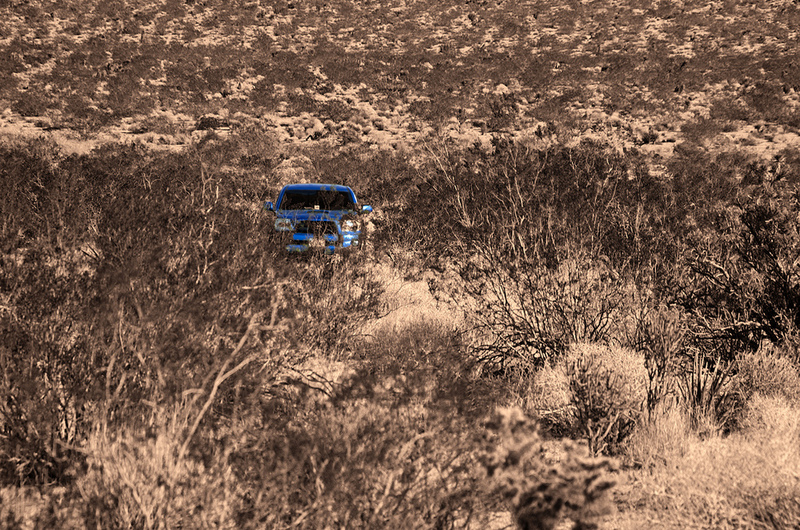 The trail is always easy to spot and follows washes, canyons, ridges....some very spectacular scenery. Around the 5 mile mark, the trail really starts to drop. It seems like most of the elevation loss along this trail takes place within a mile and a half stretch or so. The views north out over the canyons and towards Twenty Nine Palms is amazing. But this is the stretch of trail where you really need to keep your eyes ON the trail. It's steep, sometimes narrow and oftentimes slippery with loose gravel on rock. 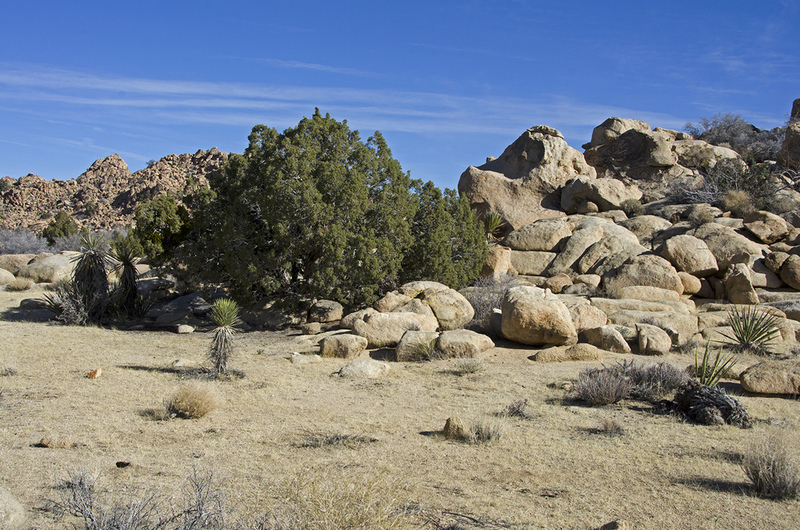 We saw large Junipers in many of the washes; there were some very lush areas with a lot of greenery. Pines and oaks also were numerous. 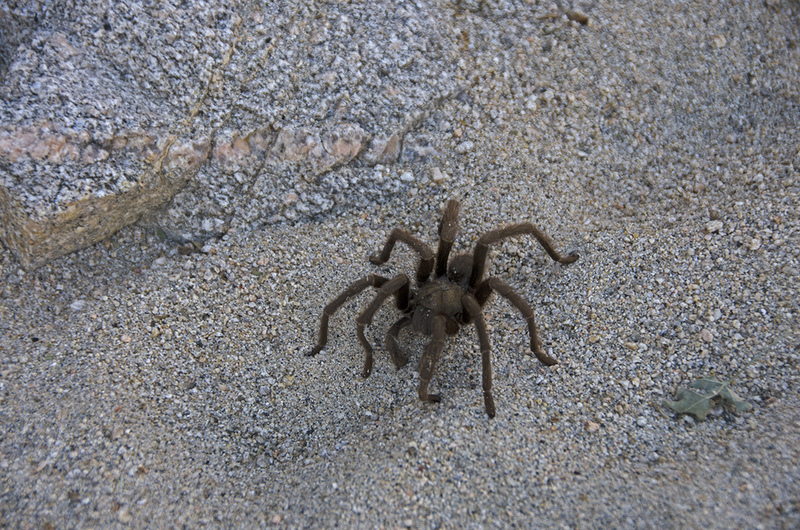 Birds were chirping, tarantulas were meandering and I'm sure other animals were keeping their eye on us, wishing we would get out of their home. 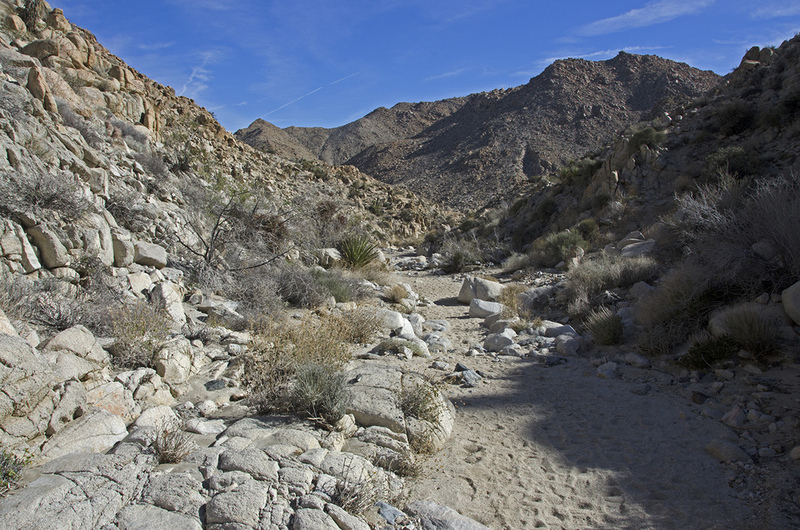 The trail finally reaches the bottom of the mountains and follows a wash out to the desert flats. The stretch along the wash was interesting to hike through, as it sometimes narrows down with steep walls on each side. It would be fun to see a flash flood rush down the canyon, viewed from a safe, high vantage point. When the wash spit us out onto the desert floor, we were still about a mile away from where we had parked, but it's an easy last mile to hike. We had traveled approximately 8 miles (different sources estimate the mileage anywhere from 7.7 to 8.2 miles; the tracking app on my phone had us at 9.33 miles.) Our hiking time was 3 hours and 45 minutes (with only a few short stops); the elevation loss was a little over 1,000 feet. 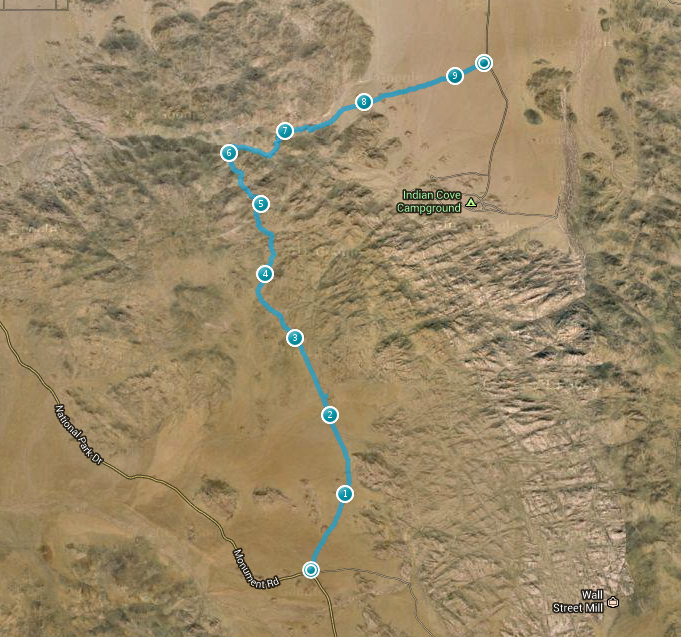 This is really a great hike and I recommend it to anyone who enjoys the desert. It took us through a transition zone from the high Mojave to the low Mojave, with a variety of different plants, rocks and trail conditions. But I definitely recommend the car shuttle approach for anyone wishing to hike the Boy Scout Trail; there and back would be a very long and strenuous hike.